Heat guns are one of those great power tools that make lots of jobs easier. There aren’t many instances where one is necessary, but your DIY life will be a lot easier with one. Whether you’re stripping paint, soldering, or thawing out frozen pipes, you need to find the right heat gun for you. With most power tools, it’s difficult to tell the different options apart, until you really drill down into the details. And that’s what we’ve done. In our search for the best heat gun, we narrowed it down to nine options. Plus, we’ve written a useful Buying Guide & FAQ section at the bottom to answer all of your heat gun questions. Wagner is a German company that is mainly known for creating paint spraying tools. But, they’re quick to point out that they do so much more than just tools for spraying your car. The Wagner Spraytech Heat Gun is one of their newer products in this vain and we’ve selected it as our Best Choice heat gun in this list. At the excellent price of $23.99 (at the time of writing), it’s one of the most affordable and impressive heat guns on the market. For these reasons, it’s quickly become a best-seller online. The gun itself comes in a bright yellow, durable casing and has a lightweight handle to make it easy to hold. There are three easy-to-use settings on the handle, which let you choose from ‘off’, ‘low’, or ‘high’ – the low setting is 750º Fahrenheit and the high setting is 1000º Fahrenheit. This gives you the flexibility to perform a range of different jobs with the Wagner Heat Gun, from thawing out excess ice in your freezer to loosening tough bolts. With all this power, you might expect it to be pretty heavy. But you’d be wrong there. It actually only weighs 1.9 pounds and is small enough to get into confined spaces. This and the fact that you can buy additional nozzles makes it a pretty versatile tool. The nozzle that it comes with is completely corrosion-resistant and it has an integrated hanging hook, so you can keep it out of the way when you’re not using it. Due to the fact that the nozzle gets very hot, it’s super important to have a way of putting it down safely when you’re not using it. It heats up quicker than most heat guns and is surprisingly quiet when it’s on full power, which is more than you can say for most power tools. You shouldn’t have any problem with neighbors! The only problem we can find with this gun is that it’s not going to last forever. Some reviews on Amazon complain that the product has given up after multiple uses. It does come with a 2-year warranty, but if you want a product that’s going to withstand decades of use, you will have to spend more money. Make sure you also check our guide to the best nail guns. Next in our list is the Genesis GHG1500A. It’s the cheapest heat gun we’ve included, and at less than $20, it’s an absolute bargain. But, as with all cheap products, we’re always a little more cautious about their quality. If you spend $200, you sort of just expect it to work. So, when something is a tenth of that price, we need to look a bit deeper. Fortunately, this product stands up. There are a few potential problems and we’ll outline them first. You choose the temperature setting using a very similar 3-position switch to the Wagner gun, and it’s got two heat settings – 750ºF and 1500ºF – which makes it even more powerful. The problem is, some customers aren’t 100% sure it can handle the extra heat at first. It’s likely that you’ll need a ‘burning in’ period before you use it properly. That means you need to blast it on the higher settings, preferably outdoors, and make sure it’s working correctly. Think of it like wearing a pair of stiff shoes in. Other than that, the Genesis GHG1500A seems like a great product. It actually comes with a choice of three different nozzle options. These are called deflector and reflector nozzles and give you even more flexibility to complete different tasks with the gun. It’s slightly heavier than the first gun, but the difference is negligible, and it’ll still feel super lightweight in your hand. Of course, any cheap power tool should come with a warning. It’s not as safe or as well-made as a Makita or Milwaukee heat gun for example. But it does meet all the relevant safety standards and comes with a 2-year warranty for home use. The bottom line is that, if you’re planning to use your heat gun all the time, you should probably invest in a better one. But for odd jobs, this will do the trick just fine. Be sure to also check out our list of the best glue guns for more great items like this. Now, for something a little more serious. The Porter Cable PC1500HG is more suited for people planning to use their heat gun regularly. It’s higher-quality in almost every way than the cheaper options available, and it’s a huge upgrade on their previous heat gun model, the Porter Cable 1700. For starters, they’ve upgraded the way it looks. It has Porter and Cable’s recognizable colors covering a tough-looking casing. And it’s not just tough-looking, it’s made to withstand some serious knocks. They’ve also included an ergonomic rubber handle, which has a power switch with two temperature options. Unlike the two previous heat guns, they don’t make it obvious how hot each setting is, but we’ve found out that they’re 900ºF and 1150ºF. Interestingly, that means it’s not as powerful as the Genesis heat gun, but it should still have plenty of oomph to get the job done. One of the best features of this product is the hands-free support stand. This means you can lay it on its back and let the nozzle cool off, whilst reducing the risk of it being knocked over. As if that’s not enough, they’ve also included an integrated handing hook for added safety. Other than that, it has a 6-foot high-grade power cord. This ensures that you get the correct amount of voltage from the plug socket, even if you are working out in the cold. Overall, we’re big fans of this product. It’s the perfect middle ground between buying a cheap heat gun and spending hundreds of dollars on one of the best. We highly recommend this for anyone who’s planning to use a heat gun semi-regularly. Our handy guide to the best electric paint sprayers features more great products like this. Black & Decker is one of the world’s most famous tool manufacturers. Their name is synonymous with both quality and good value, which is why we had to include the Black & Decker HG1300 in our list. 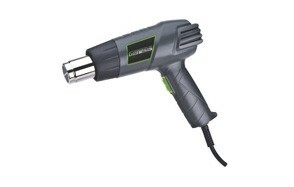 This heat gun is ideal for stripping paint, loosening nuts, thawing ice, and even soldering. It’s powered by a 1350-watt motor that puts out plenty of power but is a little on the noisy side if we’re honest. So, if you’re planning to use your heat gun in the middle of the night, you might want to look elsewhere. But, if you’re a normal person, who does their DIY in the day, keep reading. One thing that really stands out on the HG1300 is the high-quality, sturdy orange casing. This is a feature on all Black & Decker tools and lets you know it’s not going to break easily. Plus, because it’s bright orange, it’s easy to find and looks great in any tool collection. Another slight problem is that it doesn’t come with a carry case, which you would sort of expect for the price. 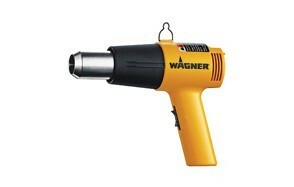 Like the Wagner heat gun, it has 2 temperature settings: 750ºF and 1000ºF. While this might not be as powerful as the other two guns, it’s still definitely hot enough to successfully complete any of the tasks you’d expect from a heat gun. And, it’s the lightest heat gun yet, only weighing around 1.7lbs. They don’t mention anything on the product listing about extra nozzles, but there is a picture of a model with one, so you can assume they’re available. Plus, it has a built-in stand that allows you to let the gun cool down when you’re not using it. All in all, it’s a fantastic mid-price range option from a company with an excellent reputation. And, if you don’t trust them, you get a 2-year warranty anyway. Love tools? Check out our review of the best screw guns for our top picks. Dewalt is another one of those brands that are known for excellent quality. 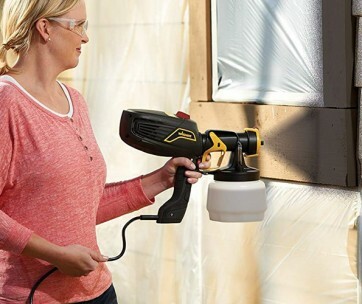 They make almost every power tool under the sun, and the Dewalt D26960K is one of the best. It was definitely a strong contender to be our Best Choice product because it really takes the idea of a heat gun to the next level. You’ll have noticed by now that most heat guns follow a standard design of having two heat settings. This the first area that the D26960K is different. It has an LCD display that allows you to adjust the temperature in 50ºF increments from 150ºF to 1100ºF. This makes it by far the most versatile and precision tool we have featured yet. It gives you the ability to find the exact right temperature for whatever job you’re doing. The other great thing about this product is that it comes with so many accessories. You get seven different nozzles, a couple of paint scrapers, and some other different tools, all included in a sturdy carry case. Dewalt has really thought of everything so you’re ready for the job as soon as you open the box. In terms of safety features, it has an innovative kickstand that is built into the body of the heat gun. There’s a cord protector to stop the cord from detaching if you stand on it or get it caught. Plus, it has an overload protection system that stops it from burning the heating element, ultimately making the product last longer. This is easily one of the best heat guns on the market. 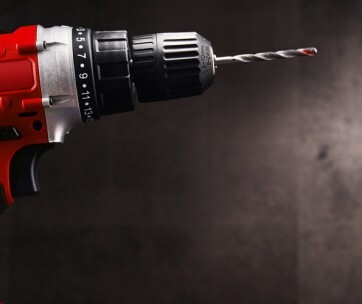 Find more great products like this by checking out our guide to the best cordless drills. The next heat gun on our list is designed for industrial applications. That includes pendulum welding, heat shrinking, soldering copper tubes, plastic pipe forming, and more. Arguably, any of the heat guns featured could perform these tasks, but Makita HG551V 1020-Degree Heat Gun is going to do the job better and for longer. The rubber body is designed to have perfect balance when it sits in your hand. And, unlike most heat guns, the temperature controls are on the top of the gun, instead of the handle. These features make it a lot easier to hold it for long periods of time. The temperature controls are also a little more advanced than other heat guns. It doesn’t have an LCD display like the Dewalt gun, but instead has a dial that gives you eleven different temperature options. These range from the minimum temp of 180ºF, right up to 1020ºF. This gives you plenty of range to find the perfect temperature and perform the task with precision. On top of this, it has two different blower speeds (8.8 and 16 CFM), so you can even control how powerful the gun is. The best thing about this heat gun is the way it’s made. You barely get any vibration or noise when it’s operating and the whole thing just feels like it’s going to last forever. Inside the gun, it has a ceramic core that protects the heating element. This means it’s not going to burn out in a couple of years, like most of the cheaper guns. The only slight downside is that it doesn’t come with any extra nozzles. You can buy them separately, but when you’re paying nearly $100, you would sort of expect them to be included. It even has a carry case with space for them! If you love tools, check out our guide to the best screwdriver sets. The MasterWorks Heat Gun is an interesting entry to this list. It’s not from a really well-known company, it’s not the cheapest, and it’s certainly not the best. So why have we decided that it deserves a place on the list of the best heat guns? Well, because it’s by far the most feature-laden heat gun for under $30. Sure, you could go for our Best Value option, but if you want extra nozzles, multiple temperature settings, and other accessories, you’re going to have to spend a lot more. So, think of this as our second Best Value heat gun. It comes with five different attachments including a reflector nozzle, a deflector nozzle, a reduction nozzle, a triangular scraper, and our favorites – a BBQ lighter. That means you’re fully equipped for anything, from firing up the charcoal to removing paint from a wall. It’s also got three different temperature settings – 122ºF, 752ºF, and 1022ºF. So, it’s not quite as versatile as the Makita and Dewalt guns, but it’s better than most of the budget options. It even has a cooling mode that allows the gun to cool down quicker than it would normally. And, there’s a small ventilation slot to stop the rubber handle from heating up. We haven’t seen these features on any of the heat guns so far, which is impressive for a company selling their products so cheaply. It’s powered by a 6.2-foot cord, which gives you about as much room to move as you can expect without it being cordless. The only real problem we can see with it is that it doesn’t have very many reviews on Amazon, so it’s difficult to say how it will perform in the long run. But it does come with a 2-year warranty, so you could hedge your bets. You may also like to check our guide to the best spirit levels. The Milwaukee 2688-21 M18 is the daddy of heat guns. Well, at least you would hope it is because it costs over three times more than its nearest competitor on this list. So, what makes it so special? Well, there are a few things. Firstly, it’s designed for use by professional tradesmen. If you need to thaw a bit of ice out in your freezer or loosen a bolt that you can’t untighten, you probably don’t need this gun. This is designed professionals who need a reliable tool for heating tubing and other applications. You can tell that it’s designed for heavy use because of the quality of the construction. It’s made to last. The second main difference is that it is battery powered. Instead of being powered by a long and cumbersome power cord, it takes its power from a REDLITHIUM™ battery. 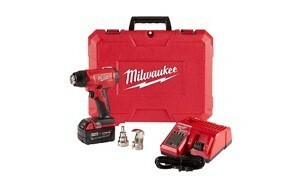 This is Milwaukee’s own brand of powerful, portable, and rechargeable batteries. It can heat 40 connections on one charge, and you can buy extra batteries if you think you’ll need them. The only real criticism we’d have of this product is that you can’t adjust the temperature. It’s impressive that it can achieve 1000ºF from a battery and it reaches that temperature in under 6 seconds. But that doesn’t take away from the fact that it’s the only heat gun on this list without an adjustable temperature. You will have to decide how important that is to the job you need it for. It’s also the most compact electric heat gun around, which means it’s great for getting into those difficult-to-reach areas. But all this comes with a huge price tag and it’s up to you if you think it’s worth it. This makes a perfect DIY gift for your loved ones. It costs three times more than a Makita or Dewalt! Master Appliance Master HG Series Heat Gun looks more like a turbo-charged hairdryer than an industrial heat gun. But, don’t be fooled by its looks, it’s as good as any other modern-looking heat gun on this list. The reason it looks different to a lot of other heat guns on the market is that it is different. It has a die-cast aluminum housing, which is painted in a glossy red paint. On the back, there is an oversized, flat rubber stand to make it easy to rest when you’re not using it. And, it is comprised of parts that are easily replaceable, so you can fix and maintain it yourself. Not many companies think about how to make their products last a long time now. There is a culture of creating products that last a couple of years and then break, but that’s not Master Appliance’s style. The heating elements, motor brushes, and other parts are easy to source and fit yourself. The model we’ve chosen has two heat settings – 750ºF and 1000ºF – but there are a lot of different options if you want something less or more powerful. This heat is provided by the powerful motor which is attached to a 6-foot power cord. The only downside is that it comes with one nozzle and it’s not clear whether you can get any other ones. If you can’t, then it’s not very versatile, but still a solid product. Our guide to the best soldering kits offers more great products so check it out. Brand – Heat guns are awesomely powerful and useful tools if you buy the right one. They’re also pretty dangerous, so you don’t want to buy a cheap, badly made gun from a brand that you can’t trust. Of course, as with any product, you can get cheaper ones and more expensive ones. Some are better than others and some are from more trusted brands. We’ve made sure that all of the heat guns on the list are from brands that have a reputation for making high-quality, safe power tools. Reviews – Reviews are an excellent resource for finding out extra information about any product. Sure, we could get every heat gun on the market, use them in every situation imaginable, and keep them for a couple of years to see if they hold up. But, if we did that with every review, we’d be up to our necks in gear. After we’ve decided what we think of a product, we scour the internet for customer reviews. Of course, not all reviews are reliable, and however good the product is, someone will have a complaint. We also check other professional reviews to read their opinions about products. It doesn’t happen often, but sometimes they’ll pick up on something we’ve missed. Quality – As we said before, heat guns can be dangerous. That means that quality is super-important. You need to know that every working part on the gun isn’t going to break when it’s under pressure. Every product we select for our Buying Guides is high-quality and reliable. Temperature control – There’s a good chance you don’t want to use full power all the time. If you’re just trying to gently heat up some glue without burning the thing it’s on, you are probably going to use a low setting. Whereas sometimes, the high-power settings are the right choice. Temperature control gives you the flexibility to find the right temperature. Nozzles – Like with a temperature dial, different nozzles give you a bit more control over how you use your heat gun. A thin nozzle means you can direct heat into a very specific area, whereas a wider nozzle allows you to spread it out. They’re essential for jobs that require precision. Safety – Safety is paramount with any power tool, and this is especially true if there’s heat involved. Without adequate safety features, your heat gun experience could turn into a total disaster. One of the most important features is the delicately named ‘dead man’ switch. If you release pressure from the trigger the heat gun will turn off immediately. So, if something were to happen to you whereby you lost control, you should still be safe. A surface stand is also useful so you can easily place the heat gun down when you’re not using it. Power source – Heat guns are powered by electricity. That means they need an electric cable that plugs into a power socket. A longer cable is useful because it gives you more flexibility in where you can use it but be careful not to trip up. Q: Can a heat gun melt solder? A: Yes. In fact, they are often called soldering guns. You can use them as an alternative to a soldering iron and they are actually more effective. They’re easier to use in confined spaces and are more energy efficient. Q: How hot can heat guns get? A: The maximum temperature of a heat gun is generally around 1,100º Fahrenheit (593ºC), but some can get even hotter than that. They normally have a minimum temperature of between 90º and 120º Fahrenheit. Q: What can a heat gun be used for? A: There are many potentials uses for a heat gun. 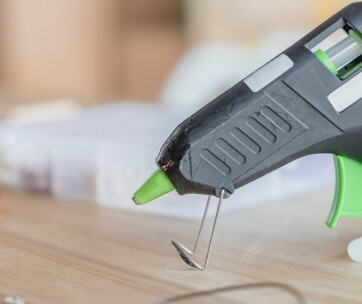 These include soldering, melting glue, thawing out frozen pipes, heat shrinking plastic tubing, paint stripping, removing wallpaper, shrink wrapping, and more.